I got motivated! I couldn't stand to look at the last mani any longer! I wasn't looking to do a major design, in fact I was looking for something fast and easy to do today, and you can see that in the last mani. I had never done a galaxy design before and I actually thought that it would be difficult...Boy was I wrong! It was so easy and I am in love with my nails! A base, a little sponging, some dotting and you get an awesome mani. I started with a base coat of Orly Galaxy Girl. This was a gift for my birthday and I had yet to use it. I bought it because I knew that when I finally did the Galaxy Nails I would defintely use this polish. I think it's a black jelly, someone can correct me on that, and it is packed full of tiny blue and purple glitter. Once it was on my fingers, 3 coats, I didn't want to put anything over it. I tried to get a picture where you could see all the glitter, I don't think I was successful. However I did find that I get the best pictures in my garage! I have lots of pictures because as I already said I am in love with this mani!!!! I am so happy with this mani! I think that I have a better time doing free hand designs like this instead of stamping. 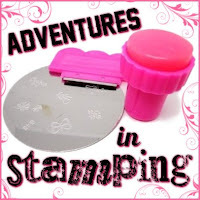 Stamping just stresses me out!